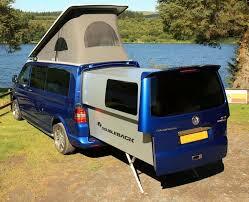 This is a Volkswagen Doubleback Campervan, class-B motor home, and it’s build from aircraft-grade components. It is the from Doubleback, Ltd (UK), and was developed by the founder and principal engineer of Doubleback, Craig McCormack. It’s based on the VW T5. 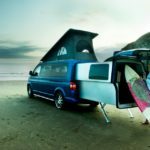 VW vans have a pretty large slice of the camper van market. This is another innovation in that area. 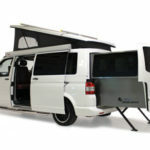 It has a large pop-up roof and a back end that extends back over six feet. 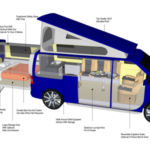 Six feet of living space that weighs just 280 lbs. 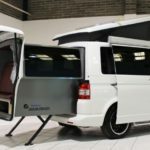 The Campervan is has been fitted out with the latest technology to enhance the driving experience, through media like a rv backup camera to make parking a seamless process. Fuel economy: 30 MPG, easily surpassing many in the same class, and a number that seems pretty competitive when looking at motor homes and other RVs. Downside: the removal of the middle pair of seats, leaving just the pilot and co-pilot seats. Price: almost $90,000. Available in the US? Not known yet. 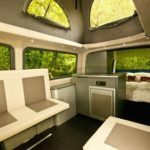 The T5 isn’t an RV you’ll see much in North America, actually. Really its market is Western Europe, Turkey and Singapore. In America, the vehicle is classed as a light truck. That means it gets chicken taxed when its imported to America – an extra 25 percent. Perhaps for this reason, the van is the worst selling in the whole North American market in 2003. That was the last year Eurovans were sold in the US. 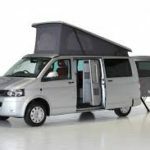 After 2003, Eurovans were replaced with VW Routans, which are build by Chrysler. 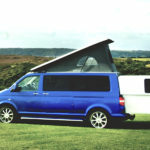 I guess you could use a Routan to do something like this campervan, perhaps. 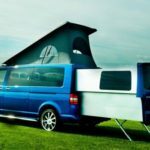 There are conversion packages available for Routans RVs. They also work on other vans like Dodge Caravan, Chevrolet Uplander, and Honda Odysee. 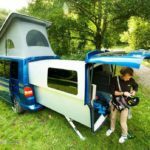 But these are just cloth additions that you put on the back, and set your table and chairs outside — not hard slide out extensions like this VW built by Doubleback. It has a range of camping amenities, including a burner and sink combo, TV, storage area, fridge with ice box, removable swivel table.